Atheneum/Richard Jackson Books, 9781442429789, 64pp. Meet best pals Monkey & Robot. This snappy collection of stories includes their first four adventures! 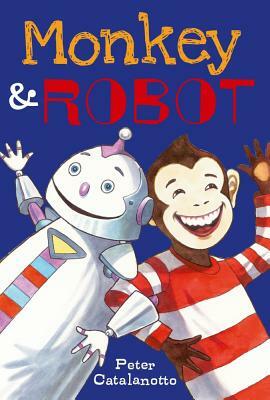 Monkey and Robot are friends—the best kind. They simply belong together, and it never matters that silly Monkey is furry, or that kind Robot can rust. What matters is their sharing: movies and popcorn, games of hide-and-seek, a fish tank for…a hippopotamus? Joining the ranks of such noteworthy pairs as Bert and Ernie, Frog and Toad, and Henry and Mudge, Monkey and Robot celebrate their friendship in this chapter book of four charming tales that are ideal for young readers. "Readers looking for funny friendship stories but who think that Frog and Toad and other early readers are a tad too easy will find this unlikely duo just right."